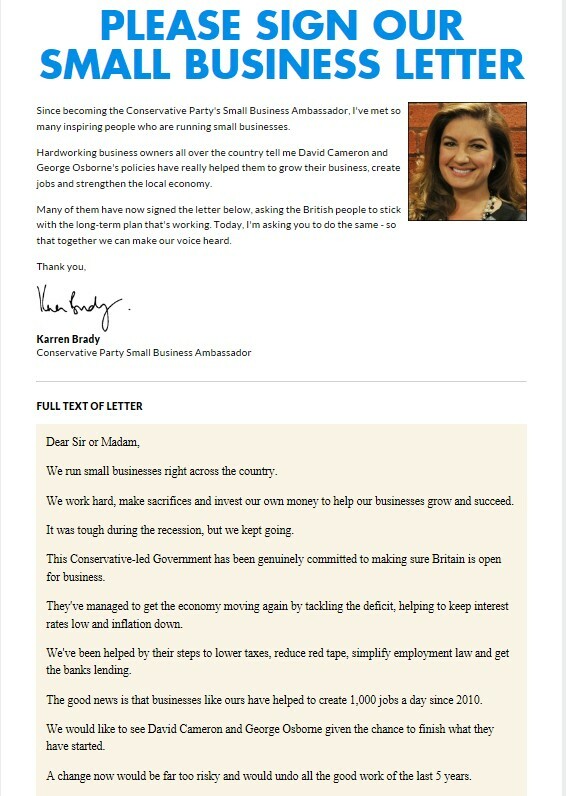 Of COURSE the Tories wrote the Telegraph ‘small business’ letter! The Tories wrote the letter that was supposed to have come from “100 business leaders” a few weeks ago – why would anyone think this was any different? The fact that the Torygraph withdrew this front page story from its website within 24 hours is testament to the weakness of the Conservative Party’s position, having tried – and failed – to hoodwink the public twice with the same trick. If anyone wants to see where the Conservatives recruited their thousands of small-business signatories, just visit the Conservative Party website here. As you can see, Karren Brady (she of The Apprentice fame) actually put her name to it so her reputation is shot now (more even than it was when she became a Conservative peer for no reason). The author of the document is listed in the metadata as “CCHQ-Admin”. And the agony got worse. The Guardian reported that, not only did the letter originate in Conservative Central HQ, but it contains many duplicate signatures and one belonging to a person who said they never signed it. How will the Conservative Party claw back its credibility after this? Why is this minority-interest party still managing more than 30 per cent support in the opinion polls? mocking cheap Tory electioneering stunts. Shameful, they do not deserve to exist in a free democratic country. Are they coated in teflon at the moment? Or is their control of the press so near-absolute that it all gets hidden away? There’s been so much potential embarrassment, but none of it sticks. I got immense pleasure watching Gauke try and riddle out of it whilst questioned by Neill, what a complete and utter shower of corrupt liars, how low can they stoop? Hope it goes viral and people see them for what they are, CORRUPT LIARS. They broke their own terms and conditions, and also the DPA. If the press told the truth about the Tories incompetence,Miliband would have a 100 seat majority. All the lies that have gone virtually unchallenged the past five years,first there was Byrnes letter left at the treasury.Yes he left a letter saying no money left,but so had others in the past,including the Tories.But Cameron pretends its not a joke,knowing otherwise. Labour bankrupt the country,but the Governor of the Bank of England,Mervyn King said it was a World Wide recession,started in the US.Gordon Brown was not that powerful that he could cause a World Wide recession. IDS has told that many lies that he seems a cross between Billy Liar and Walter Mitty.In truth,he runs a Propaganda programme that releases any old thing to the press,knowing full well that most journalists would not even check his dodgy statistics. We have had huge marches that have not been on the news,in fact it feels we are being fed Pravda,Tass like press releases.The USSR that was is now where we are with the Press in the UK. Who owns the press? Mostly the rich. Who do Tory Policies benefit? Mostly the rich.This is why Ed Miliband wants Leveson to be law; this is why the press are at his throat. Cameron’s election campaign is a shambles like the man himself. But most of his public gaffes do not make the TV – Tory Central sees to that. Whoever still trusts the tories after this blatant attempt to fool [LIE to] the british people needs their head examining. I think I would run out of ink before I could list all the LIES the tories have spouted since the 2010 election. And just to remind people, the Tory manifesto was full of lies from start to finish, just as this one probably is. Kick the lying b*****ds OUT. The Tories are hardly running their best ever campaign, are they? More thoroughly dishonest fraud from the Nasty Party. However, only die-hard Tories read the Torygraph.